We have some exciting news about some of our smallest feathered friends! 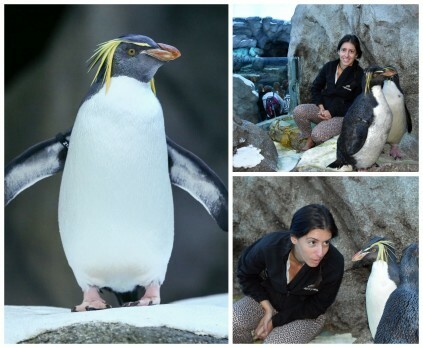 Earlier this year, curator Dr. Malu Celli was appointed the Species Survival Plan (SSP) coordinator and studbook keeper for Northern Rockhopper penguins. The mission of SSP programs is to cooperatively manage species in AZA zoos and to develop a comprehensive breeding and transfer plan which identifies population goals and recommendations that promote genetic diversity and sustainability for each managed species. “Many of these programs represent species that urgently need to be protected and the SSP, together with AZA institutions, support conservation by maintaining stable populations in zoos as well as establishing management, research, education and conservation priorities for each managed species and even reintroduction if feasible. Northern Rockhopper penguins are not widespread, in fact they breed in some of the most remote islands in the world, and sadly are considered endangered. The population in the wild is in rapid decline and threats are many: from increase in sea temperatures and competition from fisheries, to oil spills and losses to introduced predators. In captivity they are not doing much better and are found in very few zoos, and not always breeding well. As Dr. Celli stated, it’s crucial that the Calgary Zoo helps to conserve these unique penguins. While we participate in advisory groups, AZA committees and several dozens of programs, this is the first time in a few years that a Calgary zoo staff member was voted to coordinate a Studbook and SSP. With so many issues around the sustainability of Northern Rockhoppers, ensuring a healthy captive population will be a challenge. But a challenge worth tackling! Learn more about one of our most notable SSP successes here, and learn more about our current SSP list. Our zoo has how many SSP species? !